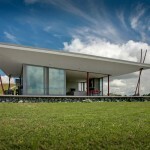 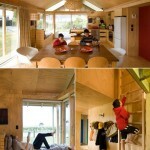 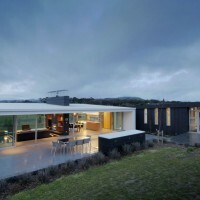 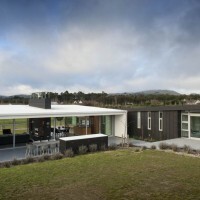 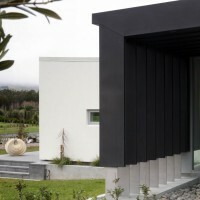 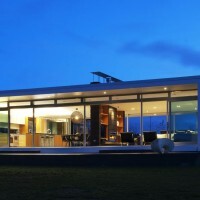 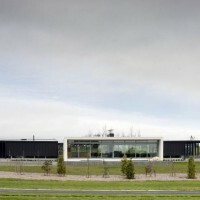 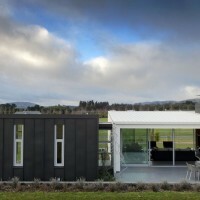 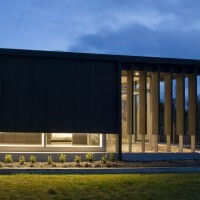 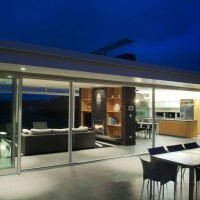 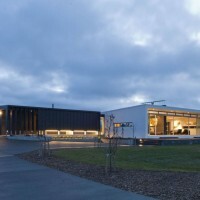 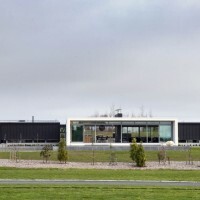 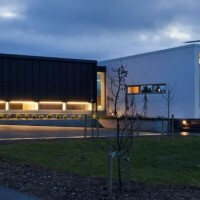 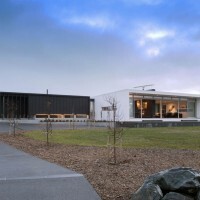 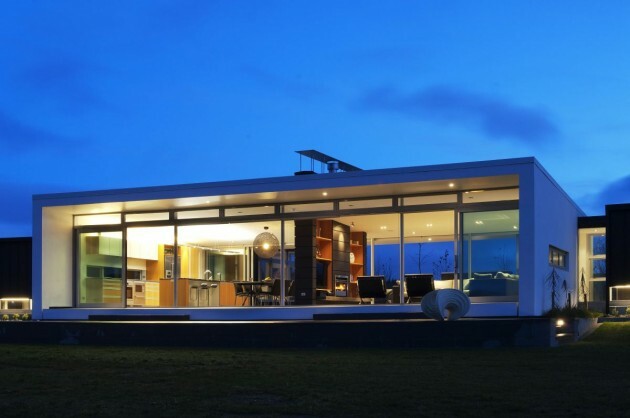 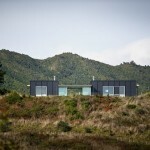 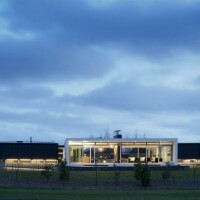 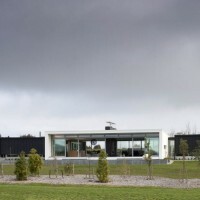 Designgroup Stapleton Elliott designed the Dixon House in Martinborough, New Zealand. 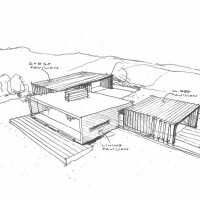 Our client’s brief required the creation of a weekend retreat as a place to relax, enjoy the rural landscape and share with family and friends. 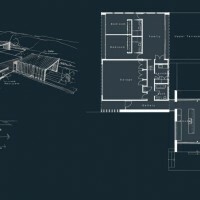 The site is located in an established residential estate adjacent to the local golf course. 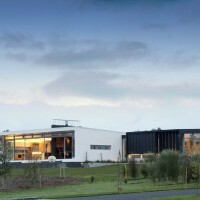 This large 5,000sqm north facing green-field site gently slopes up from the road. 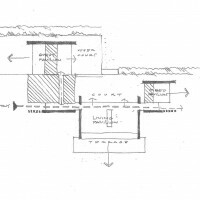 The southern boundary is marked by an elevated mound, which then drops sharply to the perimeter boundary. 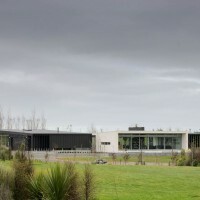 This area is densely planted. 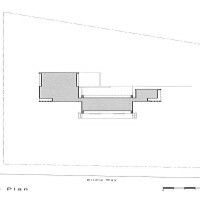 Creation of a flat platform cut into the middle of the site offered the best aspect for the proposed dwelling. 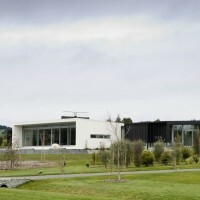 This area is elevated by approximately two metres above the access road with views to the north east towards the golf course and east and south west to the distant Wairarapa mountain ranges. 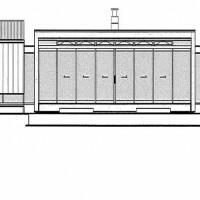 The plan is articulated into three pavilions positioned around an enclosed and sheltered courtyard. 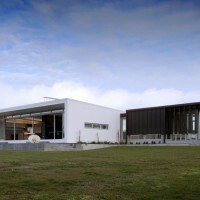 Private zinc clad shells (pavilions), one containing the master bedroom suite and another containing guest accommodation and service areas are located at each end of the house. 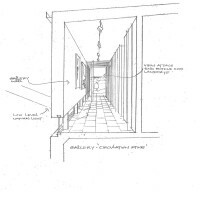 These forms are discretely positioned to sit into the contours of the site and accommodate the more private areas of the plan. 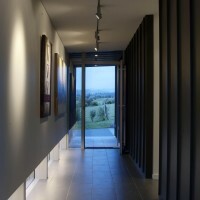 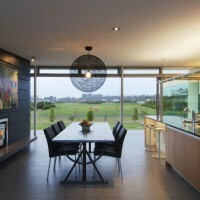 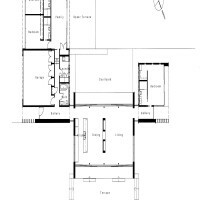 These spaces are orientated to selected views of the distant hills to the south east and northwest, whilst ensuring privacy from other parts of the house. 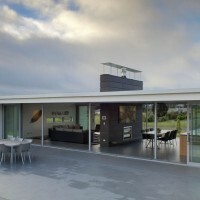 A white plaster clad central pavilion faces northeast and south west and contains common living and entertaining spaces. 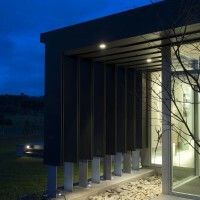 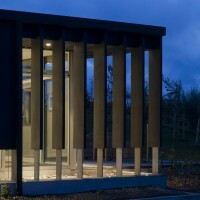 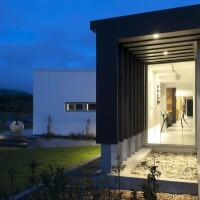 It unites the private pavilions around the ‘family social centre’ with a central focal point of a zinc-clad fireplace. 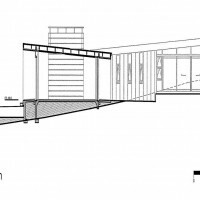 This form opens to an elevated terrace and formal front lawn on the northeastern side. 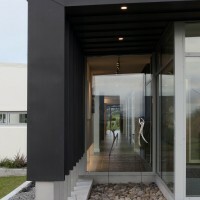 To the rear it opens onto a private courtyard. 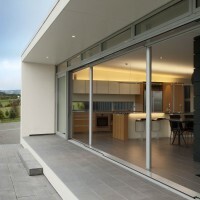 Large sliding doors either side of the pavilion retract to transform living and dining spaces into an outdoor room to enjoy hot Wairarapa summers. 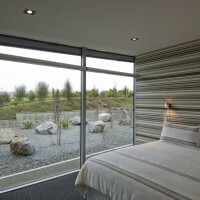 Small slit-widows in the southeast and northwest walls provide selected views of the distant hills when seated while also maintaining privacy. 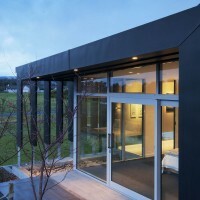 An open-ended circulation spine passes through each of the pavilions and becomes a private gallery within the zinc shells. 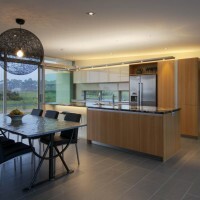 The northeastern wall of this space folds down stopping short of the floor providing low level illumination and maintaining privacy. 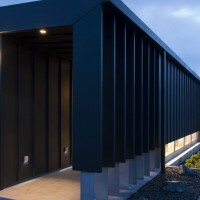 At each end the cladding dissolves into vertical louvers providing privacy to the master bedroom and shelter to the front door. 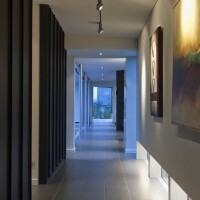 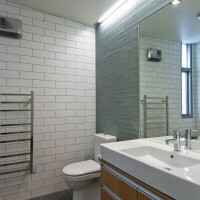 Visit the Designgroup Stapleton Elliott website – here.